So opens a story about a new world and the sky and a cat with the name Nutmeg. In our first real house since we became a couple, we had three skylights cut into the roof, turning our third floor into an Oz-like place to sit and read and sleep, and sky-gaze. We put a mattress on the carpeted floor under the skylight. You could lie there at night and see the stars and the moon. Low silent jets with their blinking red and white lights, only a few minutes after departing LaGuardia or JFK, beginning their trips to anywhere. You could picture hundreds of people in their seats, looking out tiny windows at all of us - those white dots after leaving the outlines of New York City. On a rare night you could see a shooting star. I woke up one Spring morning just before dawn. The sky was dark. A tiny dot of an Air Force jet leading a long white con-trail, inched in slow motion across the sky to the South. The sun was still around the world, but close enough to focus light on anything up there. It caught the trail, rendering two bright orange-yellow pinstripes. Witnessing these events ballooned my recently expanded chemo-sense of slow motion. What sweetened gratitude for these moments was the silence that covered the sky as these scenes bloomed and faded. The only sound, except for my internal background hum, was faint rhythmic breathing from Chow, who was asleep only a foot to the west. Traveling through this scene to whatever is next, I notice a knot, an ache - in my neck. 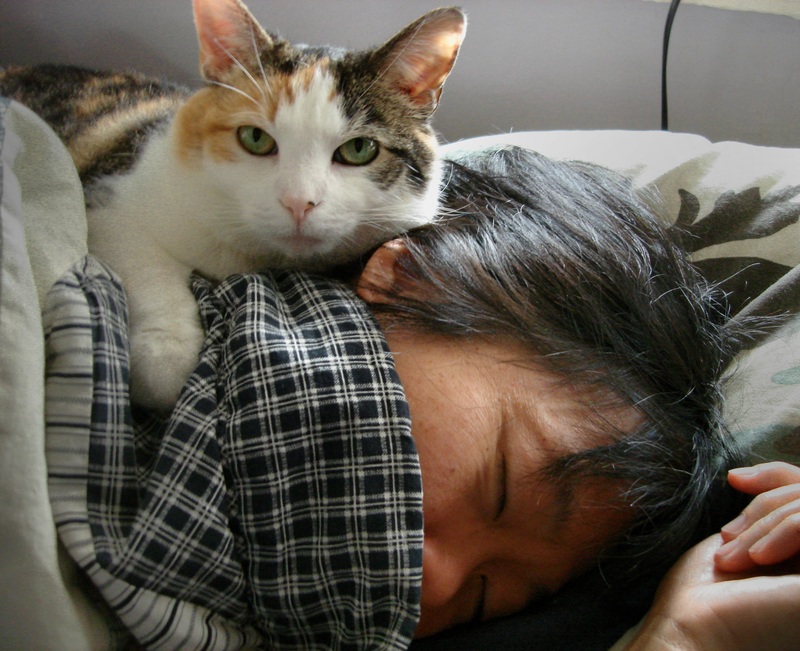 Where's my pillow? A quick scan with numb hands yields no pillow. 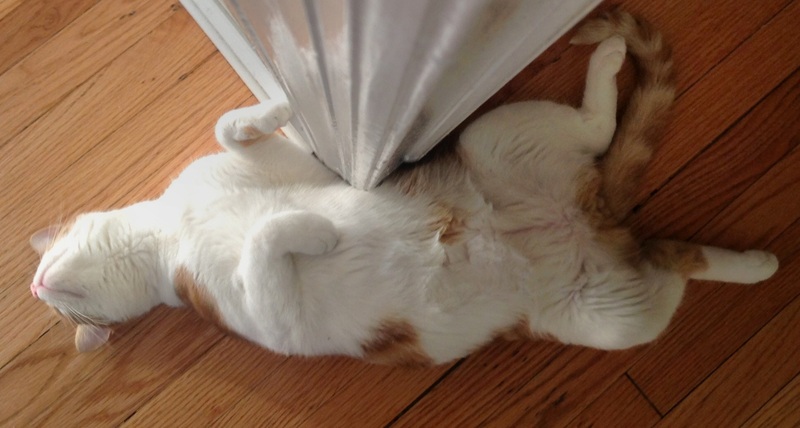 Okay, it fell off. No big deal - the floor is right there, so reaching back as I have many times, both arms pass my head and neck as they scan the floor behind me for the pillow. Softness - got it. Squeeze, and back up over my head. As I raise my neck, making room for the pillow, Chow's voice shocks me out of my gliding trance. "Terry!" What? "Terry!" As I'm getting the eyes to work together, I notice a hard bump in the pillow. My left hand feels there's a bone in the middle. What the.. I'm looking up into bulging, startled eyes, with upside-down ears below, and a closed mouth above. This is a... I'm dreaming... upside down cat! "Terry!" All legs leading to these bulging eyes are struggling to bust free. The bundle is shaking. What the...this is my pillow! I loosen my grip and Kablam - the cat is flying through the air and out the door, and I hear it tumbling down the stairs. No screams; no heavy breathing; nothing but thumps flying down the carpet. Nutmeg had come far with us. She walked into my son's life when he was at college in Gambier, Ohio. Eddie brought her back to Brooklyn, where she lived happily until he came home with two rescued pit-bull-mixes. Something had to give, and we got Nutmeg. Aloof for about a year, she softened when Chow was pregnant with the twins. 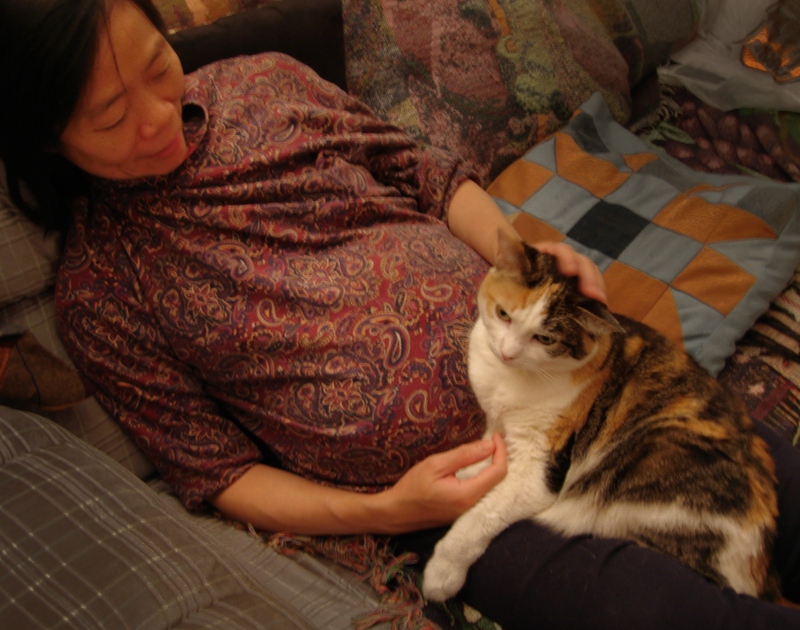 She began to sit, kneading, on Chow's belly, like a chicken on eggs. With me she remained at arm's length until my cancer diagnosis. When I began chemotherapy and collapsed every afternoon on the couch, she would hop up and sit across my legs, resting her head on my belly. That summer we became a family. After the hanging event, she didn't show her face again for more than a day. She got over it - the next night she came back to sleeping at our heads. Not long after that, no one was at home when the house burned down. We are afraid she was sleeping under the skylight. We never saw her again. They never came back to me.